Continuing with architecture from my Italy trip, this is Tomba Brion, a cemetary and memorial for the Brion family designed by Carlo Scarpa in a little town outside of Treviso in the Veneto. 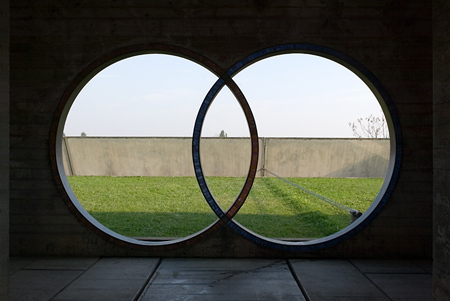 If you are interested in more Scarpa, in the Italy entry on Figure/Ground, I have a photo of a footbridge he designed in Venice and some photos of Castelvecchio in Verona. The only photos left from that trip yet to come are from Richard Meier's Jubilee Church. After that, I'll probably take a break from architecture photos and work on travel photos from Seoul that I took during a trip way back in October of last year.